Lapis star gemstone pendant sterling silver wire wrapped. You will love the simplicity of this star necklace. 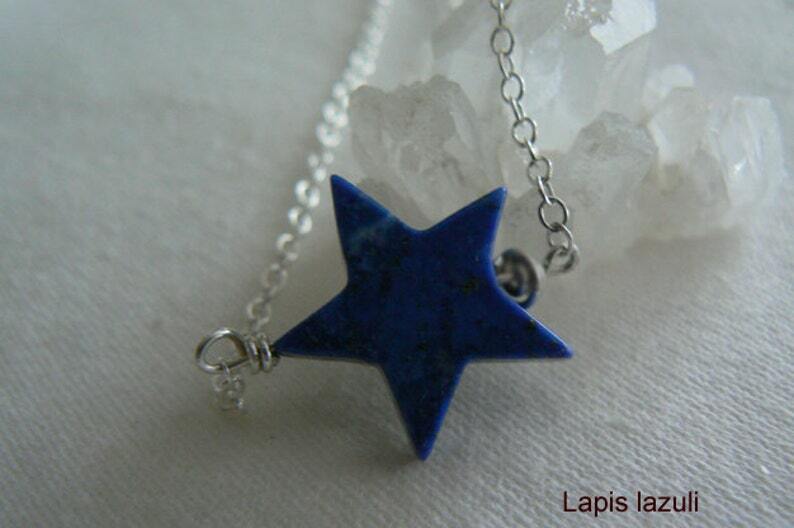 This is a blue lapis and amazonite gemstone star pendant for everyday wear. It is a polished gemstone wire wrapped with sterling silver wire. It is unique and the color and the shape grabs attention. it comes with sterling silver chain 18in long. Lapis is an ancient and powerful gem used to strengthens self awareness, in buddhism lapis is known to bring inner peace and freedom from negative thoughts. It is known also that Michelangelo used lapis as a powder to produce his intense ultramarine paints for his famous paintings. Found usually in Afganistan , Chile and US , it rules the signs of Aquarius and Taurus. Egyptians used lapis as a stone of Truth. Romans used lapis in ancient times as an aphrodisiac.